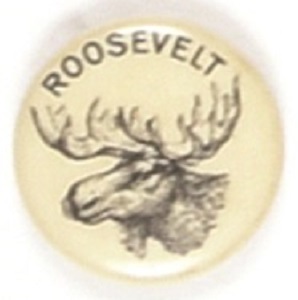 Very unusual smaller size Bull Moose pin from Theodore Roosevelt’s 1912 run for the presidency. When TR said he was as fit as a bull moose, it became the symbol for his third party campaign. This 7/8 inch celluloid has a Whitehead and Hoag back paper, excellent condition.